Recent winter westerlies and pulses of groundswell have created some clean and heavy surf against the coast. 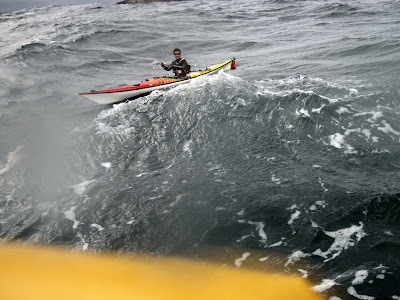 Serious surfers live for the alignment of these wind and swell events but for sea kayakers these conditions mean hard launch/landings on open beaches and a perilous slog across embayments or when returning from offshore islands. 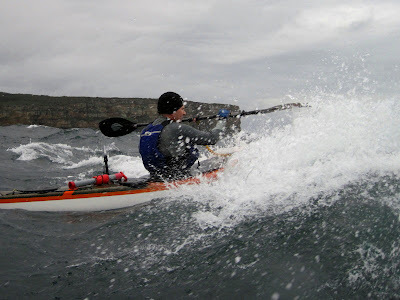 In contrast, the onshore winds that shred the swells and ruin the surf, also kick up steep sided wind waves right against the coast providing hectic but often enjoyable kayaking conditions. 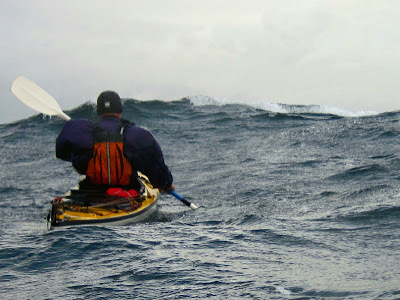 In deep water the rounder and more majestic swells travel far faster than we can paddle. According to the "Users Guide to Australian Coast"*, deep water swell waves with a 15 second period between crests will have a wavelength of 350metres and be travelling at 45knots! 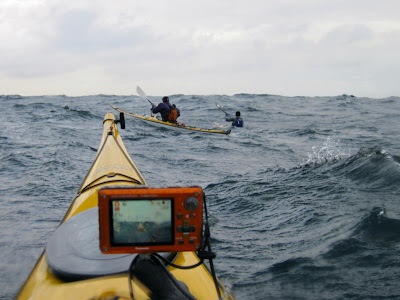 These are the impossible rides we try to catch as they roll under us at sea, and by the time they are are slow enough to catch they are in shallow water with almost vertical or barrelling faces that munch sea kayaks. 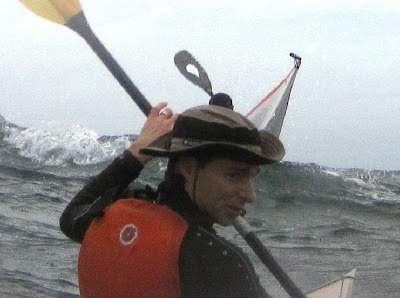 By comparison, even large wind waves of comparable height produced by a recent change will travel at only a fraction of the local wind speed thus providing steep close spaced waves that may travel within the sprint range of kayaks and other paddle craft and dissipate into foamy turbulence when they approach the beach. Initially the new wind produces ''chop" travelling at around twenty percent of the wind speed. Over time this will approach 50percent of the wind speed as the waves reach a fully developed state, at which time they will be around 5 times as steep as swell waves of the same height. So local winds produce waves that are steep, relatively slow, and close together even in deep water. When these winds are onshore, typically from the southeast or northeast, we are fully exposed as soon as we reach the sea and with careful planning or good luck we can often enjoy a downhill ride home at the end of our exertions. 1) The return paddle was over too fast. 2) I was having too much fun to take photos. 3) I was too busy listening to the skeg hum. Hans approaching some wind driven waves . Note the difference in elevation between Matt and I. This is a good indicator that things are getting steeper. Alan about to get wet. Sooner or later the toppling crests dont break somewhere else. *For an excellent discussion of wind, waves and swell see "The Users Guide To The Australian Coast" by Greg Laughlin, New Holland Press 1997.